Big thanks to them for all their hard work! I'm really love this addon and can't play without it! So I decided to renew it and share. This addon allows you to automatically filter your loot, based on your settings and keep only 'good' (for you) items and autojunk 'bad' ones. 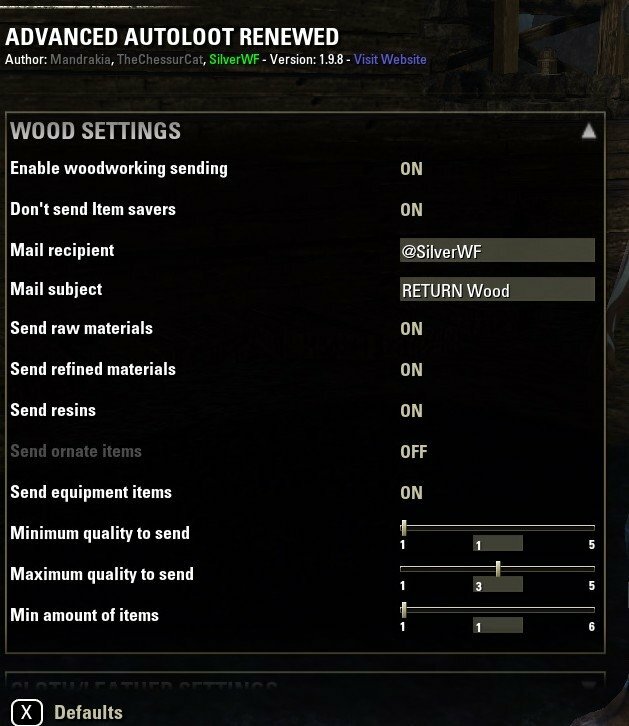 There's also a new set of buttons in the mail panel, that will send the content of your inventory to the designated crafters you configured in the settings (except the ornate items, those are for you obviously) or to your friend for mail bouncing. 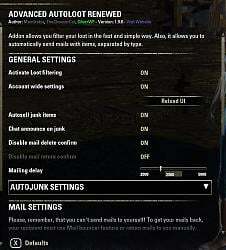 You can't send mails to yourself tho - this is ingame restriction. Filtering your loot, based on many filters (quality, type, level etc). Note: all filtration happens after looting, not before! Download and unzip them just like any another addon to the C:\Users\Name\Documents\Elder Scrolls Online\live\AddOns\ folder or use Minion for installing that addons. 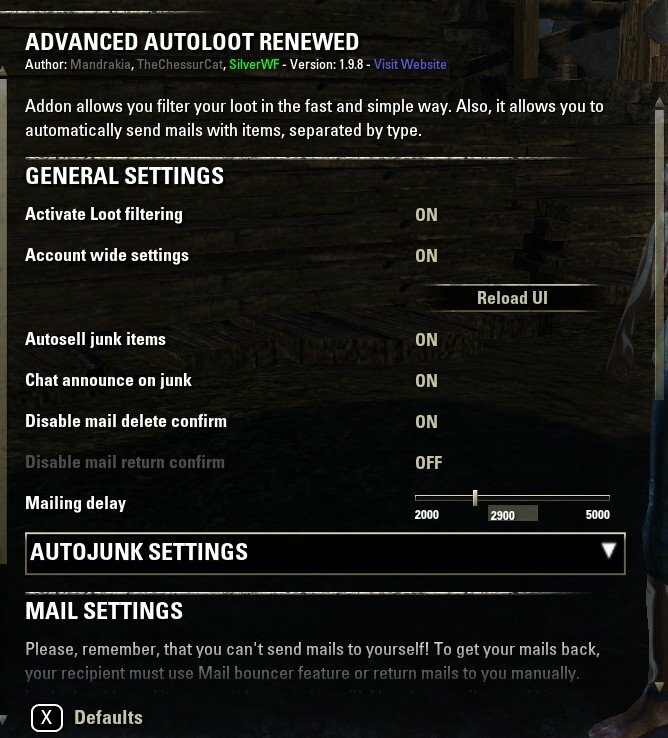 To send mails you need to open your mailbox and use specific buttons at the top right corner of the mailbox. 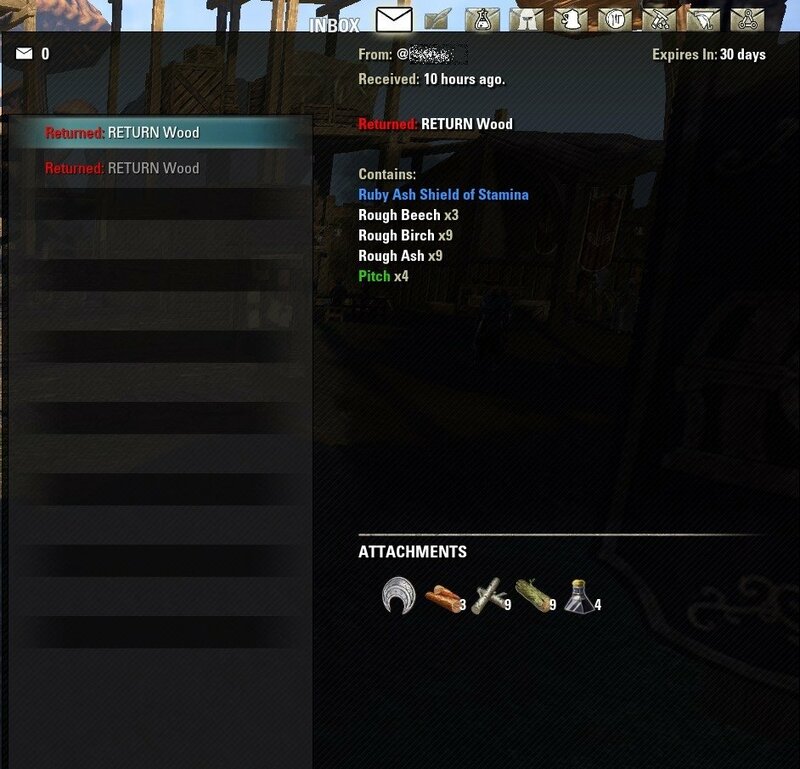 If you have some items in the bags and want to keep it, preventing from sending - just lock it (Right click on the item - Lock) or make them bound to you (just wear or convert to Imperial style, if you can). 2. Addon does not compatible with most of addons, that have a deal with your loot too, i.e. Dustman, CraftAutoloot etc. It may work, but this is not guaranteed. Attention! This version requires LibAddonMenu and LibStub libraries installed separately! + Mail Bouncer: made not optional and always ON. + Rewrote whole Mail send part. Made several independent functions, instead of one huge monster. + Added ability to suppress Delete and Return confirmation dialogues. OFF by default. ~ Triple reviewed code, added new jewelrycrafting handlers where needed. 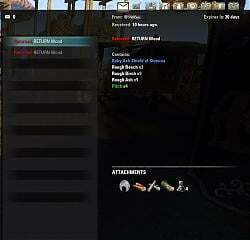 - Removed autoloot all and autoloot stolen parts completely. Event listeners for loot update too. + Potions now have separate checkbox (ON by default), but still uses the same CP-lvl filter as Food and Drink. + Added support for glyphs, on by default. + Added potions to the Food and Drinks filter. + Added treasures to the always_junk items. + Added donation support - use it if you have a will for it and you are PC EU player only! - Removed recipe CP filter, because I hate monstrous scripts. + A little autojunk filter and options page improovements. 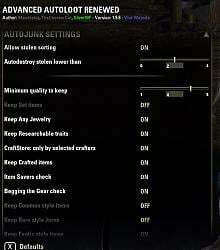 - Rewritten autojunk part for more stable and fast work. 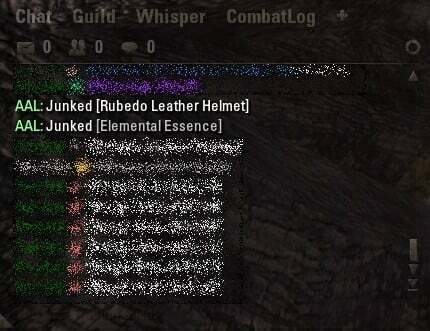 + Added function "Autosell junk items". "Off" by default. + Added poisons support. Addon would keep it by default. + Stolen items would not be autojunked anymore. + Added function "Keep rare style items", where "rare" is "Dwemer, Ancient Elf, Imperial, Barbaric, Primal or Daedric". "On" by default. + Junked items now wouldn't be sent. - Removed "Send white items" option, because there is already item rarity filter. 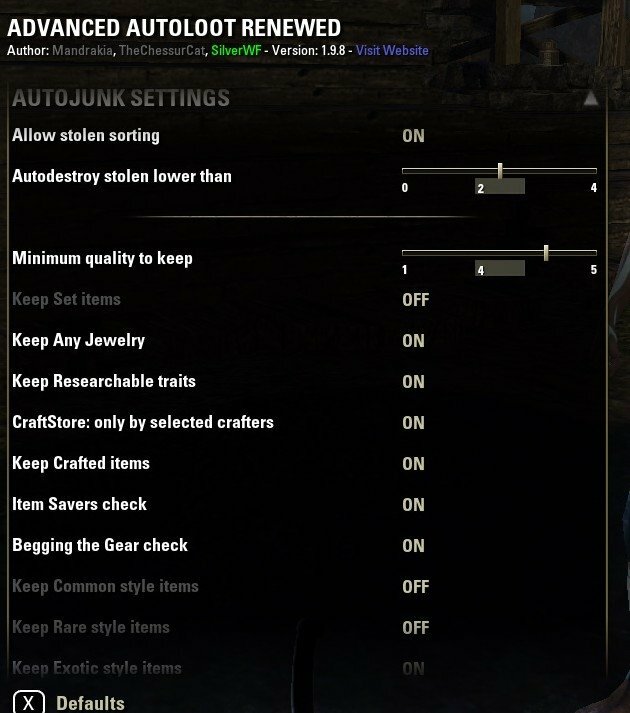 + Added "autoloot or not" stolen items option. "Off' by default. Removed loot filtering functionality because there are better add-ons for it. Reverted back to 1.5 because I'm an idiot! Updated the name auto-complete function to match API changes. Removed the "Sent X mail" debug message because it was spammy. Added new debug messages to show in a non-spammy way the add-on's progress. Left by error some debugging messages, removed them. No more /command : You can now click buttons in the mail panel ! Lately i´m having an issue with items worth 0 not getting deleted and i have no clue why that is the case. Do NOT use my account for bouncing your mails - because I'll be online pretty rare. And it useful (for me) with stolen items too: all treasures got junked, so at the Fence I'm opening the Junk tab and mindlessly pressing E to fence them all with no fear to fence some needed item. Because other items (recipes, gear etc) remains unjunked and I can look on them more closely and decide: what to fence and what to launder. Last edited by SilverWF : 09/30/18 at 11:39 AM. So if I set minimum quality to purple, and loot a blue set item that is tracked by IS/FCOIS, it will be marked as junk anyways? Because Min. Quality is higher priority? Does this work with stolen items, like things you get off nobles and guards? I'm finding that no matter what I set the equal or above quality setting to, all my higher quality stolen items are going into junk. They don't seem to have a section for post processing after the initial quality check, so I'm wondering if that has something to do with it. They're not gear or jewelry, etc. Well, in the addon logic, any ITEMTYPE_TREASURE (also as TRASH or TROPHY) are going to junk unmatter what. And if you allowed stolen sorting, then this hidden rule would affect it too. But only if it's a type that has a setting in that section below, correct? So if I steal a blue piece of armour, it will stay in the bag, but if I steal a blue dwarven dog dish, it'll get junked. Sorry.. Just trying to make sure I understand. I love the add-on btw. I have it on all my characters. It's just the thief character where this is a bit inconvenient. Is there anyway that quality check could apply to treasure types as well? or can the add-on not tell it's quality if it's one of the treasure type? want to ditch all the white quality 'treasure' and only keep the green above to sell. I suppose I could use the destroy if below min value but I'm nervous about losing thinks. Nah, you can't change it from the addon settings. Most stolen items are Treasures, so they would get junked. You can freely set deletion of white and green stolen Treasures as I did. You will loose nothing, since it's work for stolen Treasures, Trash and Trophies only. I went with the first option. I can't get the advanced filters to work. It and some other add-ons are red, even though I appear to have the right supporting libraries installed. But that's not a problem for you to fix. Last edited by SilverWF : 09/30/18 at 09:59 AM. Last edited by SilverWF : 09/30/18 at 09:22 AM. Well, why use AAL and Dustman at the same time? I'm not certain about my other toons but this level 20 toon keeps junking the soulgems (of which I lost a 100 stack). Last edited by Omikon : 09/25/18 at 01:31 PM. Attention! This version (and all in the future) requires LibAddonMenu and LibStub libraries installed separately! Mail Bouncer: made not optional and always ON. I was faced with several scammers, that just stole my mails (nothing valuable tho, just test mails). Sorry, but now it would be like that. Big thanks to Fiktius for his help in tests! If your current character can learn a trait at looted item - then it would be kept. OFF by default. Junker: integration with CraftStore added. 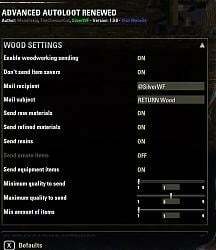 Works only if previous option is ON and you have CraftStore addon. ON by default. This option would overwrite previous one. If you have set at some character (or several) to track traits in the CraftStore addon, then AAL would try to keep items, that can be researched on them, and don't junk that items. This is smart function, that would follow of some CS setting: "Allow duplicate items". If you allowed to have duplicates in the CS - then AAL would keep any matching items. If you don't, then AAL would check if item of that type and trait already stored in the CS data: AAL would keep item if you didn't have that item yet (just looted it) or there is no item of that type and trait in your bank or in the bags of selected crafters. This option also has chat notify to let you know - why some item has been stored and which of your characters can research it. Chat notify is optional, added to already existed notify setting. Then login to the game and login at your every character one by one, to allow CS rewrite data correctly. Last edited by SilverWF : 09/05/18 at 08:19 PM. Rewrote whole Mail send part. Made several independent functions, instead of one huge monster. Works smoother now. Corresponding script was removed more than a year ago. Imperial now is 'common' (was 'rare' before). I assumed the slash command /sendmails would automatically send all of the mails that fit the criteria. it doesn't seem to do anything. Has anyone else been successful with getting that to work? If so what did you do? If not, is there something in the code I can change to make it work? It points to the sendMails function but doesn't do anything. It wouldn't work - take it as turned off. Hi, I've spent quite a good number of hours on this small, but hopefully useful AddOn.